The Saudi Labor Law does not only favor the rights and welfare of the saudi employer but also the rights of the household service workers (HSWs). In fact, there are also clauses that penalizes abusive employers. 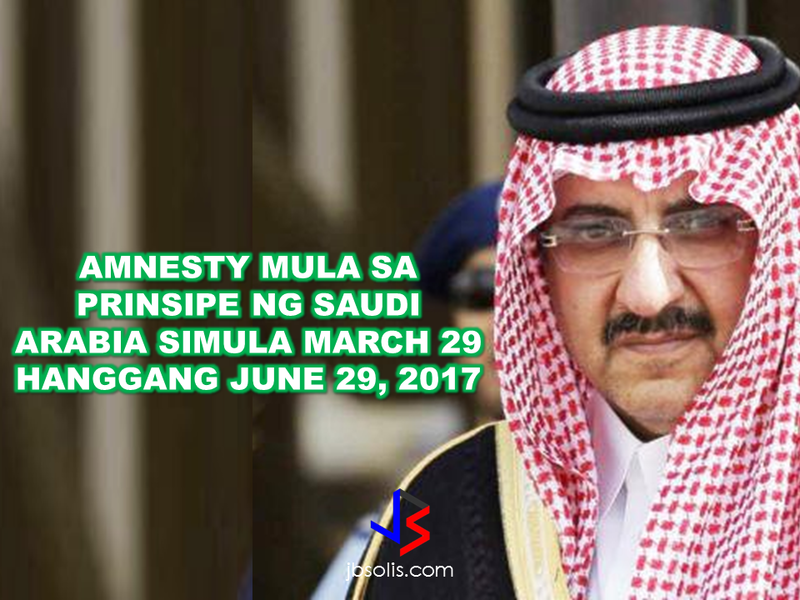 If properly implemented, the Saudi labor law could be beneficial to both parties. Let us look further what the law says about the rights of thousands of domestic workers deployed throughout the Kingdom. The domestic labor shall be entitled for a paid sick leave not exceeding thirty days per year upon a medical report proving his/her need for the sick leave. The domestic worker is not allowed to work except for what is described in the contract, or work for others, except in cases of necessity, ensuring the work is not substantially different from his/her original work. 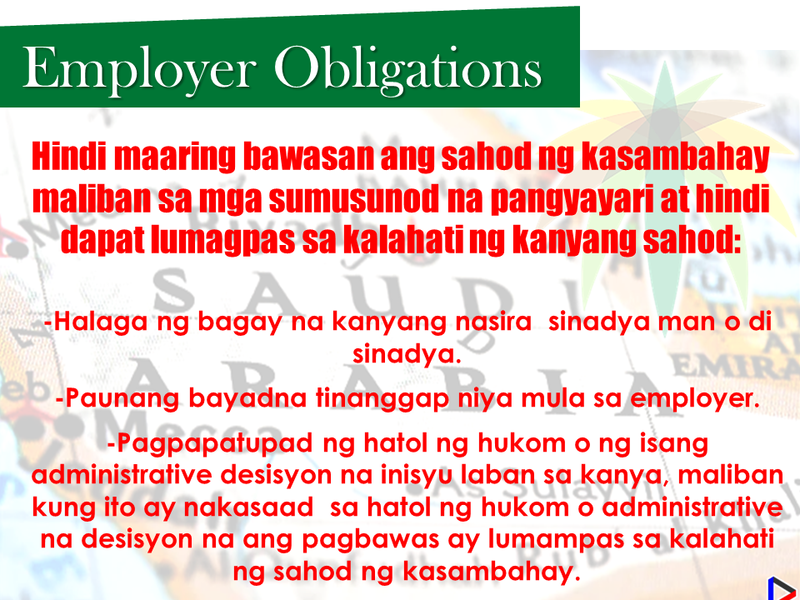 The employer is obliged not to assign the domestic labor any risky work to health or safety of his/her body, or negatively affects his/her dignity. The employer is obliged to pay the agreed wage at the end of each Hijri month, unless the parties agree -otherwise- in writing. The employer is obliged to pay the wage and entitlements in cash or by check, and document it in writing, unless the labor wants to transfer the wage to a specific bank account. The employer is obliged to allow the domestic labor to enjoy a daily rest for at least nine hours a day. The employer is obliged to attend himself/herself - or assign a representative - before the Committee on the dates specified to consider the claim filed against him/her. A down payment he/she obtained from the employer. The domestic worker must be provided with a written contract. The Arabic text shall be the prevailing version. The contract and its translation - if any-shall be issued in three copies, with each party retaining a copy and the third one shall be deposited with the Private Recruitment Office. Duration of the contract and method of extension. If the contract expired, or was canceled by the employer for an illegitimate reason, or by the domestic labor for a legitimate reason, the employer shall bear the value of the ticket for repatriation of the domestic labor to his/her country. The Contract shall expire by the death of the employer or the domestic labor. If the employer's family is willing to keep the domestic labor, they will have to check with the labor office to correct the name of the employer. The parties may agree to place the domestic labor on probation for a period not exceeding 90 (ninety) days, during which the employer shall ensure the professional competence of the domestic labor and his proper personal conduct. It is not permissible to put the domestic labor on probation for more than once with the same employer, unless the parties agree that the domestic labor shall work in a different profession. The employer may terminate the contract upon his own will during the probation period without any responsibility on him, if the domestic labor is proved to be unfit.